For years, time in the air meant time wasted as you shuttled from one city to another on business. Now, thanks to a variety of mobile devices and in-flight Wi-Fi, you can conduct business while cruising above the clouds. 1. Pick a Wi-Fi-friendly airline. The best way to maximize your in-flight Wi-Fi experience is to research options before booking your flight. 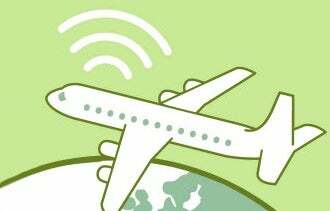 Most airlines only offer Wi-Fi on select flights. The destination, time in the air, and type of plane all come into play, so double check before finalizing. JetBlue, for instance, announced that it will be offering service free for a limited time starting in early 2013. They've chosen a provider with fast download times: 10 web pages in just over a minute, which they say is seven minutes faster than their closest competitor. Delta, American Airlines and Virgin American also offer various Wi-Fi connection packages at different rates. Before heading down the jetway, make sure to turn off any applications that auto sync on your mobile device or laptop. Services such as Dropbox, Google Drive and iCloud can slow down your connection when you're in the air. Set your email to download only when you ask for it, and turn off unnecessary notifications. 3. Plan for bandwidth-economical browsing. Graphic-heavy webpages are not your friend when you have limited bandwidth. Avoid photo and video sites while flying, as well as streaming music services. An airplane isn't the best place to multi-task, so don't plan on streaming a video while editing a Google Doc and chatting on Facebook. Instead, catch up on your RSS feeds and respond to emails. Loading a new web page takes time, but you can reduce your wait by optimizing for low-bandwidth browsing. Start by disabling unnecessary plug-ins like the Alexa Toolbar or Rapportive, and activating an ad blocker such as Adblock Plus. And visit the mobile version websites whenever possible to avoid pages with a large number of graphics or scripts. These steps can also help maximize battery life. Go a step further by dimming your display while working. No matter what device you use, you'll be surprised how much battery you can save this way. 5. Get more Wi-Fi for less. If you're in the air more than twice a month, purchase a monthly Wi-Fi pass from the airlines or from a provider such as Gogo. You can get unlimited access for about $35, saving you dollars every time you fly. Consider using your tablet or smartphone instead of your laptop to connect. Since it's likely you'll download less data with a phone, airlines often charge a lower fee for mobile-only connectivity. Save on Wi-Fi fees by checking GoGo and online coupon sites for discount codes. Airlines also offer discounts through their frequent flyer clubs and to their followers on Facebook and Twitter. What tips do you have for using Wi-Fi more efficiently when on-the-go? Let us know in the comments below.